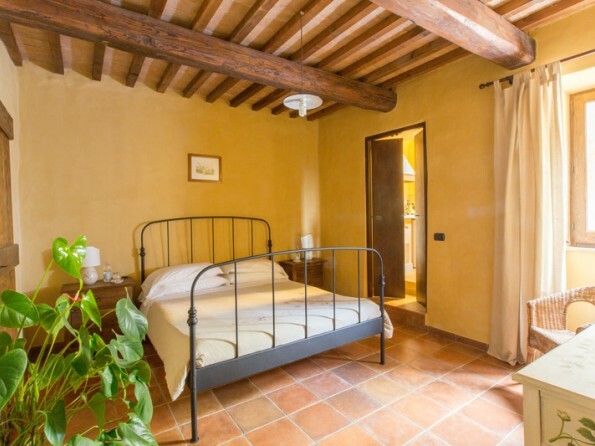 La Cuccagna is a farmhouse B&B in a simply stunning hilltop position in Umbria. From its beautiful terraces and grounds it offers unspoilt views over the hills and valleys into Tuscany. With masses to do in the surrounding area and courses on site and nearby, it’s a wonderful Italian retreat. The local village has a few small shops, and there are weekly markets in Gubbio and Perugia. There are lots of excellent restaurants within easy distance of La Cuccagna with a variety of local cuisines. Within a 30-40 minute drive of La Cuccagna there are plenty of wonderful places to visit, including medieval towns, castles, monasteries, vineyards, art galleries, rolling hills and mountains. Gubbio is 25 mins away and is one of the oldest cities in Italy. Perugia, the capital of Umbria is majestically perched on a ridge and is well worth a visit. Assisi is also close by and is a pristinely restored UNESCO world heritage site. A little further (but less than one hour) you’ll find Monte Cucco National Park, the spectacular town of Spoleto, and Lake Trasimeno. Recommended day trips include Mamore waterfalls (the tallest waterfalls in Europe) with all its watersports, and the Sibillini Mountains (also great for river sports, as well as incredible hiking opportunities). There’s enough happening in Umbria to keep anyone of any age or interest happy for a very long time! Wine tasting - an endless choice of vineyards but the owners can direct you to the best tours and tasting sessions! Walking - you can walk out of the door and go for as long or as short a walk as you like. The owners have detailed walking maps and routes for the national parks, Lake Trasimeno and other local area. Umbria is a wonderful place for walking, with beautiful scenery, and varied flora and fauna. If horse riding is your thing, or you want to try it, there are several stables nearby. For the golfers, the scenic course at Antongnolla is 20 minutes away and has a medieval castle for a backdrop! Watersports are available on Lake Trasimeno or further afield in the Sibillini mountains, and there are opportunities for white water rafting and tubing at the Mormore waterfalls. You can go paragliding and handgliding at Monte Cucco, and microlighting just 20 minutes away. There are lots of great mountain biking tracks all around. For the artists, there’s a weavers workshop a five minute walk away, you can paint, and the owners can organise art sessions for children. In the right season, you can even spend a day truffle hunting with a local hunter! What is more, it’s almost impossible to be in Umbria without stumbling upon festivals and markets where you can buy local produce and try the regional delicacies. Detailed directions provided on booking. The nearest airport is Perugia, which is 20 minutes away. Other airports in the vicinity include Ancona (1hr 20), Rome (2hr 15), Florence (2hr 30), Bologna (2hr 30) and Pisa (3 hours). Cars can be hired from Perugia airport. Rental companies include Hertz, Europcar and Avis. There are three classic B&B rooms and a deluxe suite in the main house, where the owners live. They live on the first floor, and the B&B rooms are all on the ground floor, with their own entrance and living accommodation. All rooms are either double or twin and are ensuite. There are luxury linens, plush towels, fluffy bathrobes and artisan toiletries. Two rooms can accommodate an extra guest on a pull out bed if required. The deluxe B&B suite also has a small kitchenette, seating area and private patio. The four rooms share a lovely dining / living area with wifi, and a spacious patio with a shaded pergola and beautiful views. A delicious continental breakfast of homemade and locally produced organic food is provided. A little way away from the main farmhouse are two further accommodation options - La Cisterna and La Stalletta. 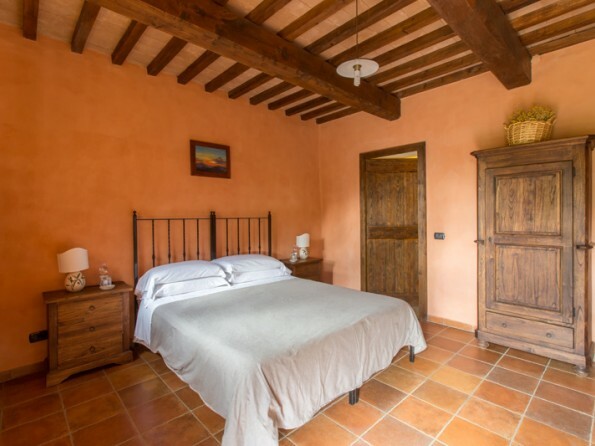 La Cisterna is a two storey B&B suite with a luxury feature bathroom and small kitchenette - ideal for a family as there’s a double sofabed in the living area. 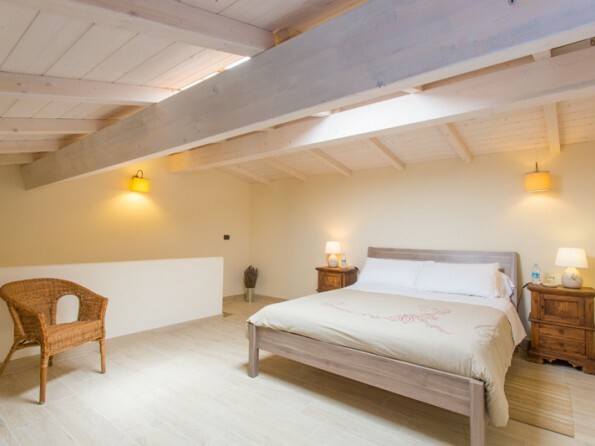 La Stalletta (The Old Cowshed) is a self catering holiday cottage sleeping 2-3 people with a separate bedroom, and its own spacious terrace with BBQ. Set in more than 11 acres of rural Italian countryside, you are free to explore the grounds, or find a quiet corner to settle down with your book and enjoy the view. The garden and pool are landscaped and planted with olive trees, vines, fruit trees and fresh herbs. 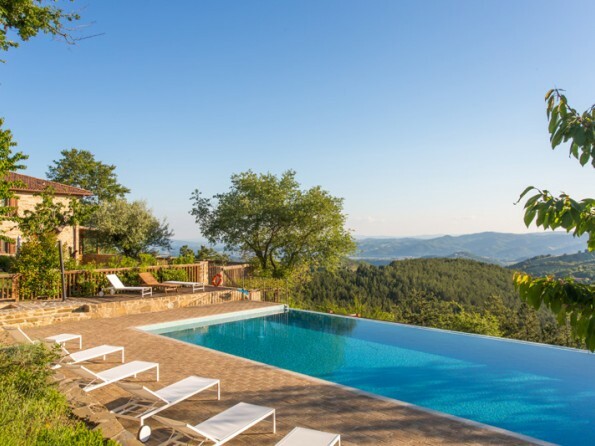 The infinity swimming pool looks out to the beauty of the Umbrian hills, and is long enough for your morning exercise, or just for a cooling dip. There’s a built in BBQ which self catering guests are free to use, and BBQ nights are available on request. There’s also a traditional stone pizza oven where Salvatore makes delicious bread and pizza, and a weekly pizza night for all guests. A variety of courses and events are available at La Cuccagna. Salvatore (one of the owners) runs half day pasta making courses on site, which finish up with a meal where you get to enjoy the fruits of your labour! If you fancy visiting in November, you could come on an olive harvesting holiday and help pick the olives! On picking days you’ll be indulged in an al fresco picnic, and you can go and visit the local olive press where you can watch your freshly picked olives being made into olive oil. La Cuccagna can also host art, photography or pilates retreats on a full board basis, including daily tuition and excursions if you so wish. La Cuccagna is also a wonderful setting for a wedding or celebration with its panoramic views from the terrace. The local area has lots of small chapels and beautiful town halls for a wedding ceremony. We offer a well stocked honesty bar and laundry service on-site.